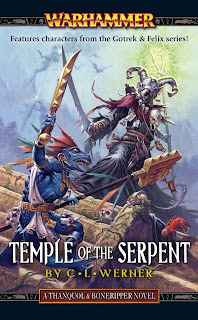 The second instalment of the Thanquol and Boneripper trilogy, ominously titled Temple of the Serpent, is my latest finished novel and its already a favourite in my fantasy collection. The exploits of the paranoid, backstabbing Grey Seer Thanquol never cease to delight and amuse, and to impress with Thanquol’s might and uncanny ability to always find a way to weasel out of a problem, either by throwing the closest Skaven into danger or flattering his way out. The novel begins with Lord Tlaco’amoxtli’ueman, a Slann, working on a problem in the geometrics of the Great Math. Confounded by new fractals and algorithms in the Math he senses the coming of corrupted algorithms to Lustria, and decides that they can be used to solve the persistent calculations that have plagued him. Meanwhile Grey Seer Thanquol delivers his report on the events in Under-Altdorf, seen in Grey Seer, to the Council of Thirteen. However his lack of knowledge on events afterwards causes him to credit Grey Seer Thratquee for the destruction of the Wormstone, and the flooding that lost it, confident the older Grey Seer will be killed for it and not knowing that 10% of Under-Altdorf was wiped out in the floods and will take generations to rebuild, thus curbing the problem, and giving all credit to Thratquee while Thanquol is left out. After the meeting Thanquol stocks up on weapons and armour and warpstone, sure that the killers of Clan Eshin are coming for him, as the Nightlord Sneek had made cryptic comments as Thanquol left, wishing him a good rest. Sure that he means a permanent rest under the dirt floors of a rat-warren Thanquol spends nearly every penny he has rearming himself, and puchasing a large and nasty Rat Ogre, naming it Boneripper. An assassination attempt is made shortly after but Thanquol is able to survive it thanks to his natural paranoia, a quick warpstone snuff, and Boneripper’s simple-minded loyalty. However the second attempt does not go as well, Boneripper is killed by a lone assassin but strangely Thanquol is captured and not killed. Dragged before the mighty Nightlord Sneek Thanquol is given a choice. He is required for a mission to Lustria to assassinate the Prophet of Sotek the Snake-Devil, a Skink named Xiuhcoatl. With the prophet’s death Clan Eshin can cement an alliance with Clan Pestilens, and Thanquol is offered the choice to go on the mission to Lustria, or leave and risk the Deathmaster coming after him again. Realizing that the assassin who easily slew Boneripper is the legendary Deathmaster Snikch Thanquol goes on the mission. Meanwhile the assassin who made the first attempt on Thanquol, a disgraced Skaven called Chang Fang, is taken captive by Lord Skrolk of Clan Pestilens, who survived his altercation with Thanquol in Grey Seer, and given an opportunity to kill Thanquol by sneaking onto the Lustria expedition. Stealing a ship and making their way to Lustria Thanquol and the Eshin group prepare themselves to slay the Sotek propet, unaware that far greater dangers await them at Lustria then a mere Skink. Meanwhile on the high seas a trade vessel, the Cobra of Khemri, is travelling to Ulthuan to make a fortune in Elf fabrics and artwork, and carrying an Elf passenger who has promised them said Elf goods. The ship’s owner Von Sommerhaus and his Captain Schachter are both devising a way to make more riches from the journey when a sudden storm blows them off course and strands them and their crew on Lustria. While Von Sommerhaus is jubilant at the chance to make riches his bodyguard Adalwolf and the Elf passenger Ethril recognize the danger that Lustria poses. However when magic forces conspire to force them further into the jungle they must face mighty carnosaurs, giant terradons and vicious cold ones, and the very jungle itself as they head deeper to the lost city of Quezta. This was an excellent novel that gave a look into the isolated Lizardmen and their Slann masters, a most interesting view into their lifes and how they view the world and its inhabitants, and the harsh duty they bear and follow, and will sacrifice themselves for, for every Lizardman has a place to play in the Great Math and all are content with the part they must play. The Skaven as always were delightfully evil, treacherous and Thanquol’s megalomania, paranoia and cruelty to his underlings, and ability to exploit any opportunity was enjoyable the whole way through. High Point: I’d say there were a few high-points in the novel. The first is when Thanquol and the Eshin killers try to ambush Xiuhcoatl at the Pyramid of Sotek. However they are ambushed in turn and the battle quickly turns into a slaughter, when asked by the Eshin mage-rat Shen Tsinge to call upon the Great Horned One to save them all, Thanquol’s response is, ‘The Horned One helps those who run fastest!,’ then shoving the mage-rat out of the way and running like hell. Hilarious!. Another high-point is when the giant serpent of Sotek swallows Thanquol in a single gulp, and is quickly assaulted by Boneripper who gets into a massive duel with the snake. The best part is when Boneripper tears the serpent’s lower jaw off and gouges its eye out, then drags Thanquol out of its gut only to be reprimanded for taking too long. A third highpoint was a humourus and interesting moment at the end. Thanquol and the dying Boneripper are rowing away in the last rowboat, while Lord Tlaco on the Lustria beach orders the Saurus warriors to catch him, however before they can leave he quickly divines some calculations and chooses to let Thanquol live, on the discovery that as long as he lives Thanquol is a much bigger danger to his own race then the Great Math, and in an act of backhanded generosity the Slann conjures a fast tide to speed Thanquol back to the mainland, hoping he will damage the Skaven as much as possible. Low Point: I could find no real low point in the novel. From start to finish it was entertaining and brimming with the ratty wit and sneaky characters that only C.L Werner can write. 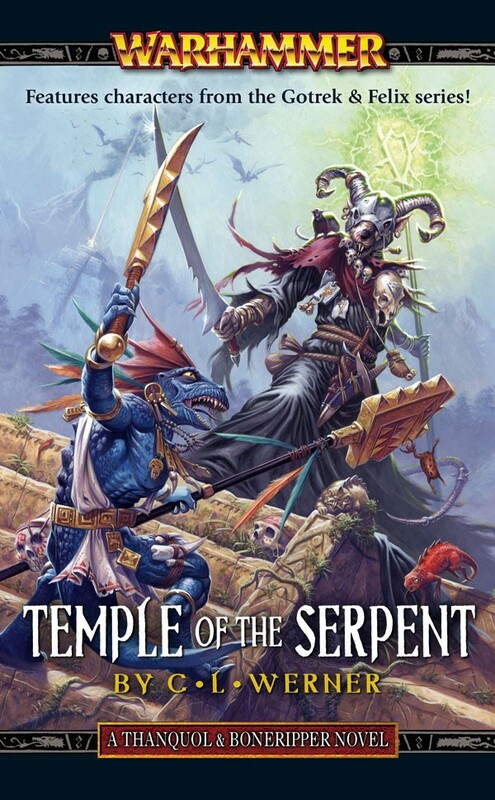 I give Temple of the Serpent a 10/10 for an excellent story, new and crafty characters, a look into the prehistoric jungles of Lustria and its cold-blooded lords, and for more of the devious Grey Seer Thanquol and his loyal guardian Boneripper. Any fan of the Skaven and the Lizardmen will love this book, and the story of humans treasure hunting in a lost world rife with deadly reptiles and rats. I eagerly await the next Thanquol and Boneripper novel, and I wonder how Thanquol is going to explain himself this time.